I am busy getting ready for the quilt show in Hershey, PA. It is july 30-August 2 at the Hershey Lodge & Convention Center. For more info: www.quiltodyssey.com It is a great show with wonderful quilts and many great vendors (like me)! Here are some pictures of our booth from last year's show. If you get to the show, stop by and say Hi. I just finished the sample I started in June. It is the free pattern that you get with the die that comes with the Accuquilt Go Cutter. I really like it. I think I may use it on a table when I no longer need the sample for the shop. I again used my embroidery machine to do the center of the quilt. 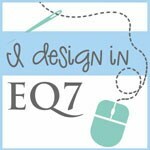 I got the quilting design from www.emblibrary.com I really like their designs. Each die that you buy for the Accuquilt Go Cutter comes with a free pattern. You can either make that pattern or use that die for other projects. I have started collecting them for projects that I intend to make in the future. We just got in two Autumn balis from Benartex, Daisies from Timeless Treasures and a bright yellow Patrick Lose marble. Kathy stopped by to chat and share her quilts with us. She has definitely been busy quilting! This compass quilt was from a pattern in a Quilter's Newsletter about 5-6 years ago. I absolutely love it! This was made from a Moda layer cake called Heritage. Kathy sewed this up in one night. This was one of Kathy's own designs. I love the red hatter! You did a super job, Kathy! I love them! We went to the Muncy Historical Society Quilt Show in Muncy, PA this past Sunday. It was a great show that featured both antique and new quilts. They had a good variety of quilts that I really enjoyed. I really like antique and reproduction quilts. 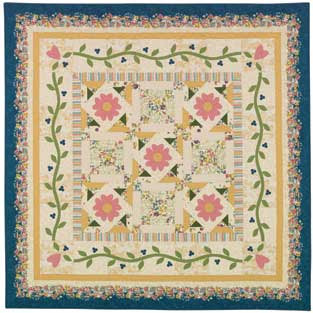 My favorite was the Muncy Compass quilt which was replicated by Judith Youngman. The original quilt was from 1855. In the reproduction quilt, 142 different fabrics were used and the same poison green color for the background. I believe the original is in the lower left corner of the picture. I also found this quilt called Burgoyne surrounded interesting. It does not follow the traditional two colors. I really like what the quiltmaker did with it to make it look so different. This is what the traditional looks like, which is also pretty. Don't be afraid to change a traditional pattern and make it your own. It will look great! We just got in 5 more bolts! These are all from Timeless Treasures. I love the daisy and bee prints, but I need to collect more of the blenders. I find that I am so attracted to prints and forget about the basics and blenders. I am starting to collect more of them so that I have a well rounded stash. We just got in this great new line from Red Rooster Fabrics called Elm Creek Quilts: The Quilter's Collection. This collection is based on the book from Jennifer Chiaverini. The fabric has a neat border print with teapots, cups, bowls of fruit and flowers. I forgot to mention in my San Antonio post that I did get to one quilt shop. The quilt shop is called Las Colchas. The shop is in an old house made from a Sears kit in 1910. I thought that was fascinating. It had many small rooms filled with antiques, wonderful samples and displays and many reproduction fabrics. Reproduction fabrics have become some of my favorites to collect so I was one happy camper! Believe it or not the woman who cut my fabric was from New Jersey! What a small world! We just got in Flutter by Benartex. This fabric is beautiful and features butterflies and flowers in chocolate browns, rose, greens, turquoise and golds. I may need some of all of them! We just returned from a trip to San Antonio, Texas. We had a great time! There were many things there that gave me inspirations for quilts. The trees, flowers, architecture, tile work and even carpet designs. 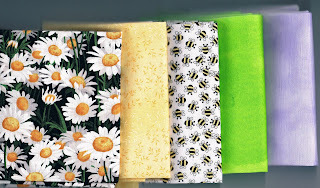 Look around where you are and you can find so many things that would work beautifully in your quilts! These two quilts were made by Bev. The patterns are from Cottage Creek Quilts. These quilts are perfect for hanging on the wall or on a door. Bev did a super job! She was very creative and used Russian needle punching for the lettering and used wool for some of the appliques. 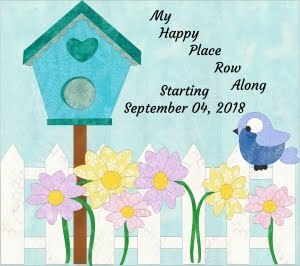 Leisa stopped by and shared her folk threads sampler block of month which we did a few years ago. The sampler was designed by Rhonda Dohna of Acorn Hill Quilts. Leisa did a wonderful job on her quilt. I really like it. I still haven't finished mine yet. She also just finished a beautiful wool quilt. It's great! Good job Leisa! We just got in a neat basic called Confetti by RJR fabrics. It would work with so many different prints and colors. 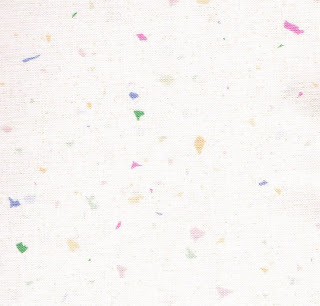 It has a cream background with confetti flecks of pink, purple, lavender, gold and greens. Today was our Cottage Garden Sampler Club meeting. The pattern we are using is by The Rabbit Factory. It is a "scrappy" sampler celebrating the love of gardens. Stacey brought in her sampler with the first two rows finished. It looks great! Way to go!